Congress leaders managed to win over dissidents and present a united front at a meeting held at Nainbagh here today. Lt General (retired) TPS Rawat, president of the Uttarakhand Raksha Morcha (URM), attacked the BJP Government for presenting a weak Lokpal Bill, failing to arrest migration, not providing qualitative and affordable education, not resolving the crisis of unemployment and issue of capital, not bringing about effective Panchyati Raj and above all leading in corruption by giving rise to 56 scams during its tenure in the state. Disconcerting voices in the widening issue of Chakrata Road once again resounded when Manjit Singh Sabharwal, shopkeeper, was asked by officials of the Mussoorie Dehradun Development Authority (MDDA) to stop construction at the vacant portion of his shop, which had remained after the demolition was completed. 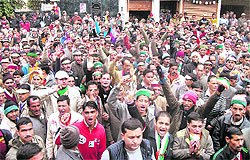 Many shopkeepers reached to the venue and began protesting. It was then Vice-Chancellor, MDDA, BVRC Purushottam, called the shopkeepers to the MDDA office and assured them that by Monday he would place a clear picture before them. Uttarakhand Kranti Dal (P) released its manifesto today where party president Trivender Singh Panwar spelt out the issues on which the party had constantly been waging battles. These include the knowledge of dialects of Kumaoni/Garhwali to be made compulsory for government jobs, Gairsain as the capital of the state and cut-off date for the domicile and caste certificate to be year 1950, as prime features of the manifesto. Hari Singh Cricket Academy and BDM, Delhi, won their respective matches in the ongoing 4th Uttarakhand Shaheed Girish Bhadri Cricket Tournament here today. More than 8 lakh persons had a holy dip in the Ganga at Brahamkund, Har-ki-Pauri and adjacent Ganga ghats on the occasion of Makar Sankranti today. Garhwal Commissioner Ajay Nabiyal urged zonal magistrates (ZM) and returning officers (RO) yesterday to undertake their responsibilities with regard to elections with utmost sincerity. Congress candidate from the Ramnagar Assembly constituency Amrita Rawat today visited Jogipura and Bhagwanpur villages of Ramnagar. The Uttarakhand Congress has accused senior BJP leader and Uttarakhand BJP election in-charge Rajnath Singh of being hand-in-glove with those who had done atrocities on Uttarakhand people during statehood movement. Congress nominee from Dhanaulti Manmohan Singh Mall, who arrived here early this morning, inaugurated the party election office at Nainbagh and later offered floral tributes to late party leader of the region Sardar Singh Rawat. The Congress workers, who had gathered in a large number in Manmohan Singh’s support, resolved to fight the elections unitedly. A senior Congress leader, Dr Virendar Rawat, son of Sardar Singh Rawat, who lost the race for ticket to Manmohan Singh, said his well wishers were saddened by the denial of ticket to him as they wanted a candidate from the Nainbagh region to represent them in the Assembly. Though many suggested to him to fight as an Independent candidate but he refused. Virendar Rawat announced his wholehearted support to Manmohan Singh amid cheers from party workers. He said he was with the people of the region and could not think of weakening the Congress by contesting as an Independent candidate. 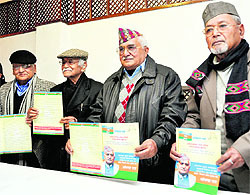 Therefore, he extended support to Manmohan Singh in the elections from Dhanaulti. An emotive Manmohan Singh said the Congress was united and all party workers were keen on strengthening the hands of the leadership so that the state could set on the path of development once again. Party workers looked happy at the outcome of the meeting and Virendar Rawat’s support to Manmohan Singh gave them the hope of the Congress winning the elections from Dhanaulti. Lt General (retired) TPS Rawat, president of the Uttarakhand Raksha Morcha (URM), attacked the BJP Government for presenting a weak Lokpal Bill, failing to arrest migration, not providing qualitative and affordable education, not resolving the crisis of unemployment and issue of capital, not bringing about effective Panchyati Raj and above all leading in corruption by giving rise to 56 scams during its tenure in the state.Rawat presented the panacea of all these deficiencies in his party manifesto which he released in city on Friday with his party leaders. He said they would establish a corruption-free government and order for an enquiry into all the scams committed till date in the state. resources, water, jungle, land and agriculture, would be devised as it has become imminent in view of the fact that 32 lakh natives of the state had moved out and 40 lakh outsiders have settled down here. industry, tourism and hydro-power projects would be developed to provide job avenues to the youth. He advocated for strengthening the Panchayati Raj and said his party would establish Panchayati Raj Act and give extensive rights to panchayat at various levels. According to the maifesto, various welfare schemes would be started for ex-servicemen, where they would be provided employment. Those awarded by the Prime Minister and President for bravery would be given one time annual honorarium. The parameters in government jobs would also be relaxed for them. The issue of caste/domicile certificates would be simplified. Rawat said the issue related to division of properties with Uttar Pardesh would also be sorted out. MDDA had already directed the shopkeepers to leave two-metre more space from the remaining part of their shops for parking purpose, on which the shopkeepers had registered their strong reservation. MDDA had been postponing clarity on this issue. He said the officers deputed in the state on the alternate basis would be returned back. To acknowledge the presence of majority of defence personnel, he said the party would open sainik schools in each district. The offers like relaxation in LPG and linkage to railway were made to the people of hill segment. The media persons who covered statehood struggle from year 1990 till 1995 would be honored as state agitators (Rajya Andolankari). The honorarium given to folk singers would be increased from paltry Rs 400 to Rs 1200. The issue of state properties, which is still attached with Uttar Pardesh, would also be sorted out. hydro-power projects affecting people, cases slapped on people for killing animals to be taken back and the farmers whose crops were destroyed by wild animals to be properly compensated. In the first match, Hari Singh Cricket Academy defeated Abhimanyu Cricket Academy by two wickets. After winning the toss, Hari Singh Cricket Academy decided to field first. The Abhimanyu team scored 188 runs in 35 overs. The Hari Singh team scored 189 runs in 34.3 overs. 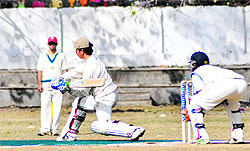 In the second match, BDM, Delhi, beat RCC, Haldwani, by eight wickets. Opting to bat first, the RCC team made a total score of 127 runs in 32.3 overs. In reply, the BDM team scored 133 runs for two wickets in 14. 1 overs to win the match by eight wickets. College Group will meet Bhiwani Bulls tomorrow. 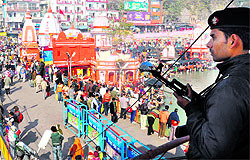 Devotees started thronging the Ganga ghats early in the morning. Elaborate security arrangements were in place to prevent any untoward incident. As the festival will continue till tomorrow, a large number of devotees are in the city. SSP Pushkar Sailal, SP (city) Yogendra SIngh Rawat, SP (traffic) Kiran Lal Shaw, CO Ajay Singh and CO (city) Shahjahan Javed Khan monitored the proceedings the entire day. While addressing them during a training session in the city, Nabiyal said it was only in Garhwal that the officials deputed for the elections were present, as most of the districts in Kumaon had witnessed heavy snowfall. He asked the ZM and RO to utilise the information imparted at the training centre for practical use and solve their doubts with the higher officials. He directed them to ensure ramps at polling booth for the physically disabled voters. Nabiyal instructed them to check the election-related material. He said the information given by the information officers to the election officers must be accurate. Earlier in the day, 29 ZM and 136 sector magistrates and 300 RO were imparted training. Meanwhile, District Magistrate Dileep Jawalkar said all permissions regarding holding rallies, processions and opening election office would be given by the RO. The permission letter should be displayed by the organisers on the suitable places. It would be the responsibility of the RO to send a copy of the permission letter to the modal code of conduct in charge, expenditure in charge, nodal police officers and the related police posts. The permission seekers should place their application 24 hours before the programme. He directed the RO to provide permission letters through single window and get no objection letters for the applicants. The city magistrate will provide permission for star campaigners and helicopter landing. He asked the RO to provide the above-mentioned information to the political parties. She began her career as a lecturer, took up a mountaineering course during vacation and also pursued PhD in Tourism in the Garhwal Himalyas, all side by side. Her mountaineering stint began with easy Black Peak. Encouraged by the first success, she cleared the test for Nanda Devi by scaling Gangotri-1 (6,672 mt) and ascended Nanda Devi (7,816 mt) in 1981, a feat which has never been repeated by any other woman. Reminiscing about her expedition, she said, “I swung with ropes with my head upside down with 20 kg bag pack on my back high above in the mountains. The death seemed imminent but the survival instinct propelled me to regain my balance.” Her fingers got affected due to blizzard by continuously climbing for 22 hour. It took her a month to complete the expedition. Her mountaineering odyssey, which began in the year 1978, came to an abrupt end with her Mount Everest expedition in 1984 when Bachendri Pal, a team member, became the first woman to scale the world’s highest peak. Feeling dejected, Bisht refused the offer when the team leader gave her last preference among girls to attempt the final climb. Distraughted, Bisht bade farewell to mountaineering and took up the arduous task of eco-regeneration and re-forestation. She planted 12,000 birch plants in denuded forests of Bhojwasa while working as an Assistant professor in Government College, Uttarkashi. She fought a relentless battle with the Forest Department of the Uttarakhand Government when they arraigned her of being an accomplice in killing wild animals. She, however, won the case. The genesis of suspicion was the white animal skin which was found from the possession of one of her worker employed at her nursery at Chidwasa. British photographer, in 1866 of the Gangotri glacier region by going to the same spot. I then compared and found receding of Gangotri glacier by about five kilometre. I’ll soon write a book on the subject.” Bisht has also written a book, ‘Tourism in Garhwal Himalayas’, and edited ‘Tourism and Himalayan Bio-divesity’. She also launched welfare projects in interior villages of Raithal and Tharali for women and children. She is happy being single as she is one of those persons who consider solitude a bliss. Her staunch faith in the Almighty and benevolence of nature never let fear cripple her determination to tread treacherous mountainous path. Three years short of her retirement, she wants to pen down more books on her favourite subject- Himalayan Mountains. During her interaction with the people, Amrita Rawat held the BJP “responsible” for the sorry state of affairs in the state. She alleged that the BJP had never paid any attention to the Ramnagar region. She said Congress leader Raj Babbar would also visit Ramnagar tomorrow and hold a road show in her favour. In a statement issued today, Uttarakhand Congress spokesman Surendra Kumar said Rajnath Singh had given promotion to Anant Kumar Singh, a UP IAS officer, who had committed atrocities on Uttarakhand state agitationists in the state agitation movement. Surendra Kumar also disclosed that son of Rajnath Singh had managed 100 bighas of land in Uttarakhand ever since the BJP Government came to power in the state. He also held that the BJP has no right to criticise the Congress manifesto as saffron party had only fooled the people in its five-year rule. He reminded that there were 5 lakh unemployed in the state when the BJP came to power in 2007, whereas today this figure has reached 7-lakh mark. Meanwhile, terming the return of BC Khanduri as the Chief Minister four months ago a political strategy, Singh reiterated that Khanduri would remain the Chief Minister in case of party wins “The issue does not grip the party. We are confident of forming the next government in the state and Khanduri would be our Chief Minister. But the services of former Chief Minister Ramesh Pokhriyal would be actively used as support for campaigning,” said Singh, while interacting with mediapersons here. He also stressed that despite changing the Chief Ministers on and off, the party did manage to give a stable government during its five-year term. Singh also flayed the Congress-led UPA Government in the Centre for playing vote-bank politics on the issue of reservation for the minorities. “We condemn the UPA Government’s decision to give reservation in jobs based on religion and caste. It is against the Constitution. We believe reservation should be given on the basis of social and economic status,” he said. While focusing on the Uttar Pradesh elections as well, Singh said the UPA had failed on all fronts and it’s leaders had begun behaving like defeated warriors even before the war had begun. “Things had come to such a pass that for the first time the Law Minister was recently served a notice for violating the model code of conduct on the issue of reservations, so much so that the Prime Minister was forced to give an explanation to the Chief Election Commission,” he said.